The Cutera CoolGlide system delivers pulses of light energy, which cause the blood within the vein to coagulate, eventually destroying the vessel, which is later absorbed by your body. Blood flow will then be redirected to veins deeper below your skin’s surface, just where it should be. Patients normally resume routine activities immediately. However, it is recommended that you avoid vigorous activities such as strenuous exercise for the first 24 hours after treatment. ALL parts of the body can be treated with the Cutera CoolGlide™ laser. Typically, one or tree treatments are needed for significant improvement of spider veins. Treatment can be done every 6 weeks on the face, and every 2-3 months on the legs. Cherry hemangiomas (red dots on the body) usually only require one or two treatments. 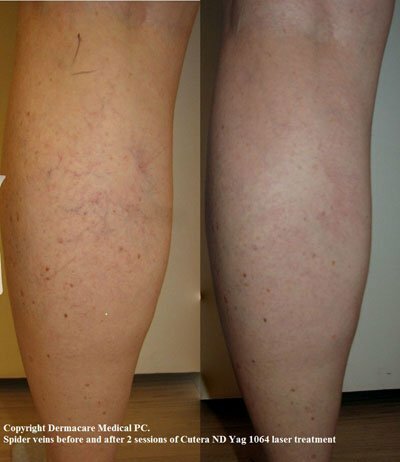 How much are you embarrassed by unwanted blood vessels? Consultations about Cutera CoolGlide laser removal of blood vessels can usually be arranged within one week simply by calling 212-223-2235. Treatment can sometimes be done on the same day as the consultation, or within a couple of weeks. Redness often has faded within a day or two. It would not be uncommon for the skin to be slightly drier that evening and to require more of your favorite moisturizer. The treated blood vessels may appear slightly more obvious for the next week or two, but this is seldom a cosmetic problem.